Relax by the water at Kelingking Beach and Atuh Beach. Explore hidden gems such as Scuba & Snorkeling and Nature & Wildlife Tours. 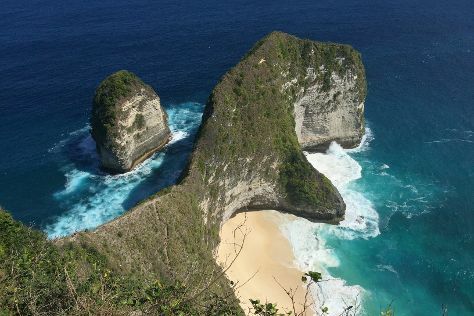 For more things to do, maps, other places to visit, and tourist information, go to the Nusa Penida trip planner . Tel Aviv, Israel to Nusa Penida is an approximately 23-hour flight. The time zone difference when traveling from Tel Aviv to Nusa Penida is 6 hours. July in Nusa Penida sees daily highs of 34°C and lows of 28°C at night. Wrap up your sightseeing on the 3rd (Sat) to allow time to travel to Pemuteran. Kick off your visit on the 4th (Sun): discover the deep blue sea with a scuba or snorkeling tour and then explore the gorgeous colors at Menjangan Island. On the 5th (Mon), you'll have a packed day of sightseeing: take in the natural beauty of Banyuwedang Hotspring and Explore Bali barat, then take in the architecture and atmosphere at Catholic Church Of Sacred Heart Of Jesus, then take in the architecture and atmosphere at Church Of The Sacred Heart of Jesus, and finally wander the streets of Palasari Village. To find reviews, ratings, more things to do, and other tourist information, use the Pemuteran trip maker website . You can do a combination of ferry and car from Nusa Penida to Pemuteran in 3 hours. Alternatively, you can do a combination of ferry, bus, and taxi. Cap off your sightseeing on the 5th (Mon) early enough to go by car to Kintamani. With mountains, volcanic lakes, historical temples, and a rich local culture, a Kintamani holiday offers plenty of delights. Discover out-of-the-way places like Mt Batur and Sekumpul Waterfalls. Popular historic sites such as Tirta Empul Temple and Mount Kawi are in your itinerary. There's much more to do: see the sights as you ascend with a climbing tour, look for all kinds of wild species at Enny Chritsmash Mountain Guide, take in the awesome beauty at Lake Batur (Danau Batur), and make a trip to Kintamani Plateau. For where to stay, photos, more things to do, and other tourist information, go to the Kintamani travel route builder site . You can drive from Pemuteran to Kintamani in 2 hours. In August in Kintamani, expect temperatures between 34°C during the day and 28°C at night. Finish your sightseeing early on the 9th (Fri) so you can drive to Amed. You'll get in some beach time at Jemeluk Beach and Amed Beach. Visiting Shark Diving and Lipah Beach will get you outdoors. Explore Amed's surroundings by going to Karangasem (Ujung Water Palace & Tirta Gangga). There's lots more to do: contemplate the long history of USS Liberty Shipwreck, make a trip to Amed Shipwreck, take in the spiritual surroundings of Lempuyang Temple, and relax and rejuvenate at some of the top local wellness centers. For other places to visit, photos, where to stay, and tourist information, refer to the Amed road trip planner. Traveling by car from Kintamani to Amed takes 1.5 hours. Alternatively, you can take a bus. Traveling from Kintamani in August, expect slightly colder with lows of 24°C in Amed. Finish your sightseeing early on the 12th (Mon) so you can drive to Kuta. Get in touch with nature at Balangan Beach and Blue Point Beach. Discover out-of-the-way places like River Rafting & Tubing and Scuba & Snorkeling. You'll find plenty of places to visit near Kuta: Pecatu (Bingin Beach, Nyang-nyang Beach, & more), Taman Ayun Temple (in Mengwi) and Ungasan (Melasti Beach & Green Bowl Beach). There's still lots to do: look for all kinds of wild species at Turtle Conservation and Education Centre, pause for some photo ops at Ground Zero Monument, contemplate in the serene atmosphere at Pura Ulun Siwi, and surround yourself with nature on a nature and wildlife tour. To see other places to visit, traveler tips, ratings, and tourist information, use the Kuta route website . You can drive from Amed to Kuta in 2 hours. Another option is to take a bus. Plan for a bit warmer nights when traveling from Amed in August since evenings lows in Kuta dip to 28°C. Finish your sightseeing early on the 20th (Tue) to allow enough time to travel back home.